PORTLAND, Ore.- The Oregon Tech Men's Basketball Team rebounded from a Friday night loss at No. 15 Warner Pacific with a thrashing of Multnomah University Saturday evening by a score of 93-67 at Lytle gym. Oregon Tech (17-8, 10-5 CCC) opened the game on an 11-0 run and never looked back leading at one point in the second half by 33 points. 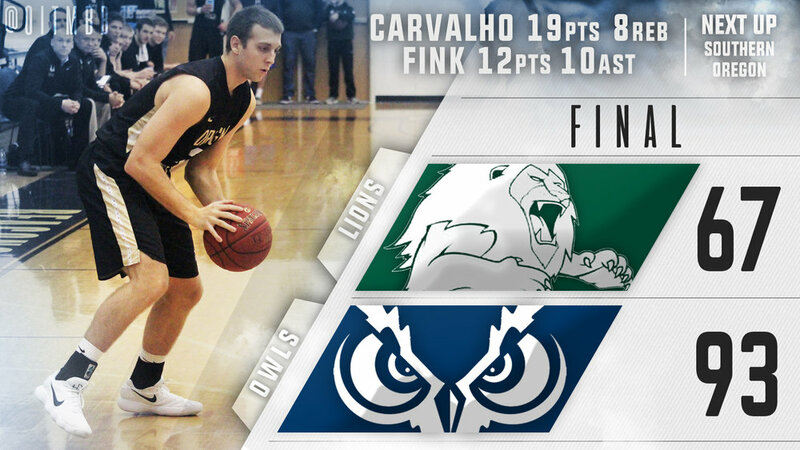 Six Hustlin' Owls scored in double-digits led by Jalen Carvalho and his 19 points. Carvalho added eight rebounds to his stats. Mitchell Fink tallied a double-double with 12 points and 10 assists. The Hooter snapped out of 3-point shooting slump making 11 of 22 for the game. The Owls were relentless on the boards garnering a huge 58-28 advantage including 14 offensive caroms while holding the Lions to only two offensive put-backs. Next up for the Owls will be another road contest at Southern Oregon on Wednesday Night. SOU is now in second place in the CCC standings with a 10-3 mark and are 15-7 overall.